Store fresh udon noodles in the refrigerator or in the freezer. If you don't have fresh udon noodles, you can substitute with dry pasta or dried noodles of your choice. The vegetables are up to you - keep the vegetables thinly sliced so that they cook quickly. Sliced zucchini, small broccoli florets, cabbage and even frozen corn/peas are great. I've used shimeji mushrooms, but you can use fresh shitake or just regular white button mushrooms. If you are using a different kind of miso other than shiro miso (white miso) lessen the amount by a couple teaspoons. Shiro miso is the least salty and intense of all miso. In the meantime, in a medium pot, bring the stock to a boil. Lower the heat to medium and add the carrots and cook until the carrots are crisp-tender, 1 to 2 minutes. Add the mushrooms and snow peas and cook until slightly tender but still bright green, about 1 minute. In a medium bowl, add the miso paste. Add a ladleful of hot broth. Whisk until the miso is completely dissolved, then pour the entire miso mixture into the pot with the soup. Do not boil the soup with the miso, as the miso will become gritty. Stir in the noodles and the green onions. 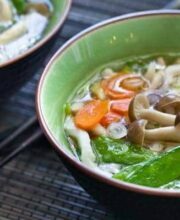 Udon Noodle Soup Recipe with Miso - Copyright 2017 Steamy Kitchen, Inc.